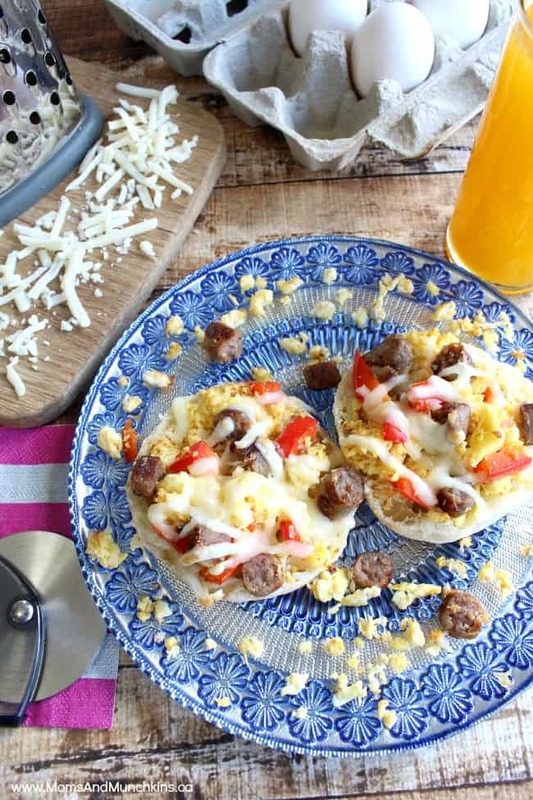 With so many food groups in these mini breakfast pizzas, it must be healthy…right?! It’s a great way to sneak in some vegetables into a morning meal. If you chop up all of the ingredients ahead of time, it’s a quick and healthy breakfast meal to enjoy before school or work. Simply load on as many toppings as you like, pop into the breakfast oven for a few minutes and your breakfast pizzas are ready to enjoy! You can let your kids choose their mini breakfast pizza toppings in this easy to make recipe. Top each half of an English Muffin with onions, green peppers, scrambled eggs, breakfast sausage and shredded cheese. Pop these mini breakfast pizzas into the oven (or toaster over) for a few minutes until the cheese melts. You may want to fry some of the vegetables for a little bit first so that they are a bit less crispy fresh on the breakfast pizza. I leave my vegetables raw when topping them on the pizza but it’s up to your own taste preference. What would be your favorite topping for a mini breakfast pizza? For more delicious recipes, check out our special Recipes page. We have plenty of recipes perfect for entertaining like appetizers and tasty desserts. We’re always adding new delicious ideas and we’d love for you to stay updated on all the deliciousness by following along on Facebook, Twitter and Pinterest. If you ever need suggestions on food to make for a party or special event, be sure to let us know and we’ll do our best to find you a recipe that’s both easy to make and sure to impress. oh yum,I would go with eggs, ham and cheese please! LOVE IT! I’ll have to make these for Little One this week! Thanks for sharing! Love your blog! You forgot BACON! Great idea. If there is bacon on it my family will eat it! How could I have forgotten the bacon?! My husband would be so disappointed in me! Cute idea. This might actually get my picky toddler to eat! Looks awesome, and super-easy too! (Always a plus.) We’re always looking for ways to expand our “breakfast horizons” so we’re not just dishing out oatmeal or cereal & fruit each day. BTW love the recipe plug-in. The print button is great! These look and sound delicious, I’m going to try them very soon! Thanks for the recipe.